Distinguished Professor M. Suhail Zubairy will discuss advancing beyond the diffraction limit in optical lithography at 4 p.m. today, Friday, Oct. 19, in Physics Building 133. 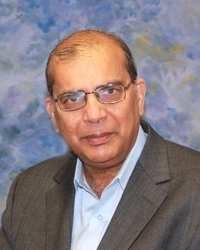 Refreshments will be served in PHYS 134 at 3:30 p.m.
Zubairy is a distinguished professor of physics at Texas A&M University and holder of the Munnerlyn-Heep Chair in Quantum Optics. He is widely considered to be a leading authority on quantum optics, quantum communication, and quantum computing. His other research interests include coherent atomic effects and quantum thermodynamics. More information about this event can be found at www.facebook.com/uarkphysics. The University of Arkansas research is a step toward solving the mystery of how disk galaxies maintain the shape of their spiral arms. The accomplishments of alumni of the College of Engineering were celebrated with induction of Joe Ray "J.R." Jones into the college's Hall of Fame and awards presented to distinguished alumni. Access Pass holders may renew their passes for the 2019-20 season, which includes admission to all home football and men's basketball games, plus an official Trough T-shirt for only $85. Dennis Clark, associate university librarian for research, learning, and spaces at the University of Virginia, is a candidate for dean of University Libraries at the U of A. He will give a presentation April 24. April is Sexual Assault Awareness Month, and for the 17th consecutive year, the Northwest Arkansas' Take Back the Night march will be held, this time on Thursday, April 25.